A big herd of dozens of bison suddenly crosses the forest track ahead of us at full speed. A second or two later the large animals are already gone, impressingly fast and agile as they are. Well, I guess that was it. A bit of a disappointment of course, but at least we did see them. Living completely wild here as they do, I did expect them to be pretty shy and wary. Even though I had hoped to be able to photograph them… Luckily, I was soon to learn a few more things about bison. This is the West Pomeranian region of NW Poland and we are in a quite sparsely populated, mixed forest and farming area, no more than an hour and a half’s drive from the German border, or the Polish city of Szczeczin. Here, in an active NATO training and shooting range live a completely wild herd of bison, some 54 head strong today. Not that far away from here, near Miroslawiec, lives another herd, of 79 animals. 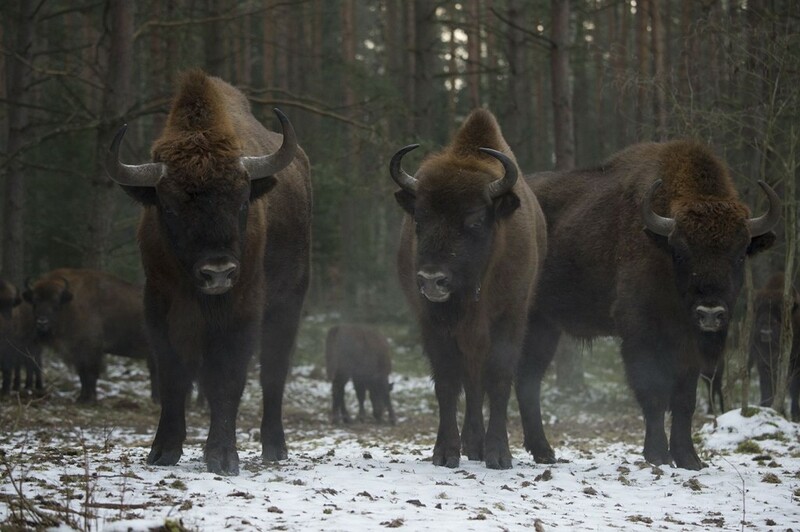 These two sites represent some of the most exciting steps taken so far, in order to bring back the European bison to the normal European countryside. The lessons from here will be very important for the rest of Europe. I am here with Maciej Tracz and Marcin Grzegorzek, two active members from the Association ”Zubry Zachodniopomorskie” (”The West Pomeranian Bison”). They are leading the research and conservation measures around these two bison herds. The animals that we just saw passing at high speed, origin from a group of 16 that were first brought here in 2008. The herd in Miroslawiec is the founder herd in the region, and it started off with 8 animals in 1980. Those 8 bison have now increased in numbers to 133 living in the wild, plus a dozen in captivity at a bison info centre that is just being built. Around 80% of the females in the two herds have a calf every year, which is seen as an exceptionally high rate of reproduction. They are obviously very happy animals. Together with the neighbouring herd, these bison produce about 25 calves per year, which means pretty much the equivalent of a new founder herd, every year! They also live a life without any fences and are free to roam where they wish. This is where the first surprises come: they strongly prefer the open grass- and heather-covered heathlands and the adjacent dry pine forests, and they don’t really stay long in any broadleaf forest area. –”They are grass-eating animals”, states Maciej Tracz, ”so they go for areas with grass. And there is a lot of grass on the heath and also in the pine forest, plus of course in the meadows, they love meadows”. The military area is large in size and not open for unaccompanied visitors. In the background I can hear the reason why: a cacophony of heavy machine gun fire and the crackling of small arms, interspersed with the odd booms from tank cannon shots. But I was in for more lessons. When the bison took off, Maciej got out of the 4×4 truck and started calling them back, sounding a bit like a traditional cow farmer in the Alps, singing out their names. Almost beyond belief, I then see some fifty bison rapidly come trotting back towards the car. In a minute Maciej was handing out apples to them and the bravest of them even ate out of his hand and got scratched on the forehead. A very, very odd experience. Wild, hairy and to many people scary beasts, that are completely relaxed in their relation to man. Soon the apples were finished and immediately the herd backed off from us and kept a clear 20-30 metre distance. They were not worried, but just kept two sentinels on the watch nearest to us, while the rest of the herd lay down, ruminating. All the time with the intense sound from war weapons in the near background. The reason why Maciej and Marcin knew where the herd was, is that two cows in the herd have satellite tracking collars, and on top of that, there is a feeding site nearby. ”We don’t really need to feed them, from a nutrition perspective, they find their own food perfectly well, but we feed them from management reasons” explains Maciej. 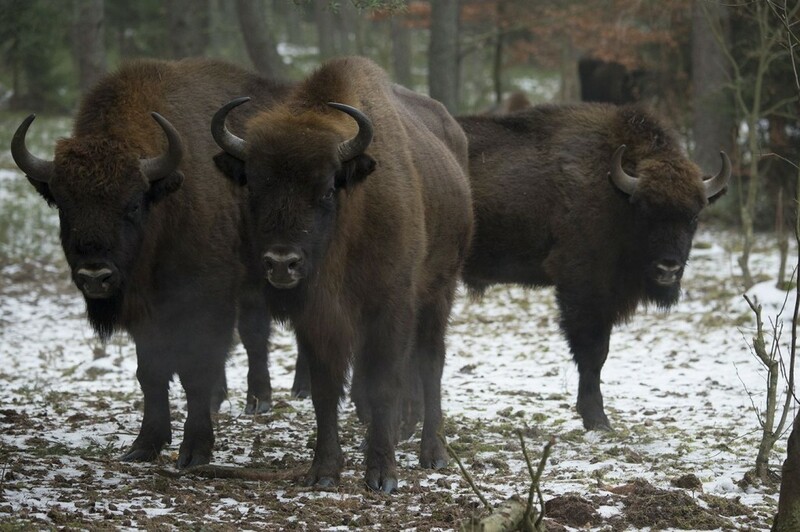 ”These are the first wild-living bison in this area for many hundreds of years and since they are still new to the whole region, we don’t want them to have any problems with people. If we feed them a bit here, they will hang around in the military area rather than walk onto the main roads or into the farmlands. After some more years, when people here have gotten more used to the idea of it being a normal thing with bison in the region, we will phase out the feeding. Also the apples” he says and smiles. that they get to meet many people, who all don’t kill/wound/scare them. Looking into the crystal ball, I can see this herd grow and soon split up in several herds, for many years to come. I see healthy young bison that could be used to re-populate site after site in suitable terrain. Why not in the Odra delta region, where there are several suitable areas for them? And after all, for a Swede, thinking about having bison running around in the landscape is not that much different from having the 350 000 elk/moose that we already have running around in Sweden. With bison like these, I would not hesitate to go picking berries or mushrooms in their forests. But should I bring some apples or not?